Dan Bailey (born January 26, 1988) is an American football placekicker for the Dallas Cowboys of the National Football League (NFL). Bailey grew up in the Oklahoma City area and played college football at Oklahoma State University. Following the 2011 NFL Draft, Bailey signed with the Dallas Cowboys as an undrafted free agent. He has the highest field goal accuracy of any kicker in NFL history. Bailey was the most accurate kicker in 2015, tied with New York Giants placekicker Josh Brown, with 93.8% converted and 100% of extra points converted. Born in Oklahoma City, Bailey grew up in Mustang, Oklahoma, and attended Southwest Covenant School where he was an all-state, all-conference kicker and a first-team all-city punter (as selected by The Oklahoman), while playing eight-man football. As a senior, Bailey had 51 touchbacks in 61 kickoffs. He holds high school's records for longest field goal (50 yards), most field goals in a season (seven) and career (14). He was also an individual state champion golfer. Bailey graduated from Southwest Covenant as valedictorian of the class of 2007. Dan Bailey, #85, at the Alamo Bowl in 2010. Bailey originally accepted to walk on at University of Arkansas, in order to receive an academic scholarship that would cover his tuition. After losing the competition for the starting kicker job, he was approached by head coach Houston Nutt and told that he would have to pay his own way, so he wouldn't count toward the team's scholarship limit. Forced to leave the school, he spent one year out of college before walking on at Oklahoma State University. As a true freshman in 2007, Bailey made 20 of 20 extra point kicks but only two of four field goals. Bailey made field goals from 27 and 28 yards and missed two attempts beyond 40 yards. Until the 2008 Holiday Bowl, Bailey made 10 consecutive field goals in his sophomore year (2008). With a 78.9% field goal conversion rate (15 for 19) this season, Bailey was second in the Big 12 Conference in field goal percentage. Bailey made a career-long 45-yarder in the 2008 Holiday Bowl, a 42-31 loss to Oregon. Bailey made 46 of 46 extra point attempts and 13 of 18 field goals in 2009 as a junior. In the October 17 game, a 33-17 win over Missouri, Bailey made 4 of 4 field goals, including a career-long 51-yarder. In 2010, Bailey made 24 of 28 field goals and 65 of 66 extra points. He won the Lou Groza Award for the nation's top kicker following the season. He earned the Big 12 Conference Special Teams Player of the Year award. Oklahoma State won the December 2010 Alamo Bowl 36-10 over Arizona, and Bailey made three of three field goals in that game: from 40, 50, and 44 yards. Bailey was signed by the Dallas Cowboys as an undrafted free agent following the 2011 NFL Draft on July 25. At one point during training camp, he had to compete with 3 other place kickers that included David Buehler, Shayne Graham and Dave Rayner. He was named the starter at the end of the preseason, with Buehler remaining on the roster as the kickoff specialist. In the second game of the regular season against the San Francisco 49ers after missing a chip shot attempt in the first quarter, he made a 48-yard field goal to send the game into overtime and the eventual game winner from 19 yards out. In the week 3 18–16 win over the Washington Redskins, he tied a rookie record by converting six field goals (accounting for all of Dallas' points). This was the first time since 2001 that the Cowboys won a game without scoring a touchdown and the sixth in club history. He became the third rookie in NFL history to make six field goals in a game. Garo Yepremian made six of eight Nov. 13, 1966, for the Detroit Lions, and Jeff Reed made all six Dec. 1, 2002, for the Pittsburgh Steelers. This performance earned him NFC Special Teams Player of the Week honors. 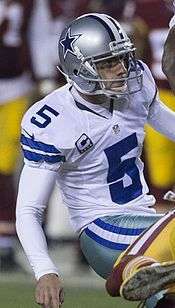 Bailey would go on to complete one of the best kicking seasons in franchise and league history by a rookie, making 32-of-37 (86.5%) field goals, second-highest kicking percentage for a rookie, setting a Cowboys rookie record for most field goals made in a season (32) and in a game (6), tied Chris Boniol for the second-most consecutive field goals made (26) in club history and was named to the Pro Football Writers Association All-Rookie team. On November 20 (Week 11), Bailey kicked his first game-winning field goal, a 39-yard kick in overtime to help the Cowboys beat the Redskins 27-24. Bailey missed a potential game-winning 49-yard field goal on the December 4 (Week 13) game against the Arizona Cardinals. With the game tied at 13 and 6 seconds left in the fourth quarter, Cowboys coach Jason Garrett called a time-out before the snap, but Bailey's kick was good. Following the time-out, Bailey kicked the field goal short and to the left, leaving many Cowboys fans frustrated, convinced Garrett had just iced his own kicker. In overtime, the Cardinals won 19-13 on a touchdown by LaRod Stephens-Howling. On December 11 (Week 14), however, in a game against the New York Giants with the Cowboys trailing 37-34, Bailey's first attempt at a game-tying 47-yard field goal was interrupted when Giants coach Tom Coughlin called a time-out, effectively icing the kicker. Bailey's first kicked ball did go through the uprights. However, Giants defensive end Jason Pierre-Paul blocked Bailey's kick after the Giants timeout. Bailey converted three field goals with distances of 32, 26, and 22 yards in Week 3 (September 23), a 16-10 win over the Tampa Bay Buccaneers. His last field goal in the game put Dallas up 16-7, a two-possession lead with 2:47 left. Dallas lost the Week 6 (October 14) game 31-29 to the Baltimore Ravens after Bailey missed a last-second 51-yard field goal. With 32 seconds left, Tony Romo made a 4-yard touchdown pass to Dez Bryant, but because the following two-point conversion failed, Bailey had to make an onside kick. Dallas recovered the kick, but Bailey's 51-yard field goal attempt sailed wide right with six seconds remaining. The following game (Week 7, October 21) against the Carolina Panthers, Bailey kicked 28- and 38-yard field goals within the final 4 minutes in Dallas' 19-14 victory. In the Week 11 (November 18) 23-20 overtime win over the Cleveland Browns, Bailey made the tying 32-yard field goal with 2 seconds left in regulation and the winning 38-yard field goal in overtime. After trailing the Cincinnati Bengals 19-10 with 6:35 left, Dallas beat Cincinnati 20-19 in Week 14 (December 9). The fourth quarter comeback consisted of a touchdown pass from Tony Romo and a last-second 40-yard field goal by Bailey. In the Week 15 game on December 16 against the Pittsburgh Steelers, Bailey hit a game-winning 21-yard field goal following a 36-yard interception return by Brandon Carr. In overtime, the Cowboys won 27-24. This win kept the Cowboys' postseason hopes alive. In the final two weeks of the 2012 season, Bailey kicked a field goal in each game, both resulting in losses. The Cowboys would miss the playoffs. Bailey moved into third place in club history with 77 career field goals, after making 2 against the Minnesota Vikings. He also set the franchise record for most field goals over 50 yards for a single-season (6) and a career (11). On January 23, Bailey and the Cowboys agreed on a new seven-year contract. Bailey's new contract is worth $22.5 million with a $4 million signing bonus and a total of $6.6 million in guaranteed money. On September 21, he set a franchise record with his 28th straight field goal, making a 40-yard attempt in the third quarter against the St. Louis Rams. On October 5, he missed a potential game-winning 53-yard field goal against the Houston Texans at the end of regulation, breaking a franchise record streak of 30 consecutive makes dating back to the previous season. He later kicked the game-winning 49-yard field goal in overtime. On October 12, Bailey became the most-accurate kicker in NFL history with a 48-yard made field goal in the 1st quarter of the Cowboy's 30-23 eventual win over the Seattle Seahawks. He now has made 102 of 112 field goal attempts (91.07%). Bailey moved into second place in club history with 182 career extra points, passing Mike Clark after making 3 against the New York Giants in the season opener. On December 7, he made four of four field goals, including a game-winning 54-yard field goal with seconds remaining, to lift the Cowboys to a 19-16 win over the Washington Redskins on Monday Night Football. This performance earned Bailey his second NFC Special Teams Player of the Week award. He was selected to his first career Pro Bowl in December, after making a career-high 93.8 percent of his field goals attempts, including being perfect (19 for 19) from 39 yards or closer. After the NFL decided to move back the extra point distance from the 2-yard line to the 15-yard line, he responded by making a perfect mark of 25 out of 25. 1 2 3 4 "Dan Bailey". Oklahoma State Cowboys. Retrieved January 3, 2013. ↑ "Oklahoma State kicker back in groove". Retrieved February 19, 2016. ↑ "10 things to know about Dan Bailey, including taking a record from Barry Sanders". Retrieved February 19, 2016. ↑ Associated Press (October 17, 2009). "No. 16 Oklahoma State snaps four-game home skid to Missouri". ESPN. Retrieved January 3, 2013. ↑ Ubben, David (December 9, 2010). "Dan Bailey wins the Lou Groza Award". ESPN.com. Retrieved 2010-12-09. ↑ "Dan Bailey Is Big 12 Special Teams Player of the Year". Oklahoma State Cowboys. November 30, 2010. Retrieved January 3, 2013. ↑ Associated Press (December 29, 2010). "Justin Blackmon helps Cowboys win school-record 11th game of season". ESPN. Retrieved January 3, 2013. ↑ "Cowboys begin the free agency period". ESPN.com. Retrieved 2016-05-09. ↑ "Archer: Rookie kicker calmly makes history". ESPN.com. Retrieved 2016-05-09. ↑ "Dan Bailey". Dallas Cowboys. Retrieved 2016-02-29. ↑ "Dallas Cowboys hand Washington Redskins sixth-straight loss as Dan Bailey boots 39-yard field goal in OT". New York Daily News. 20 November 2011. Retrieved 20 November 2011. ↑ Watkins, Calvin (20 November 2011). "Jerry Jones: "I was very nervous"". ESPN Dallas. Retrieved 20 November 2011. ↑ "Cardinals cool off Cowboys in OT after Dan Bailey misses FG in 4th". AP. December 4, 2011. Retrieved December 12, 2011. ↑ "Tampa Bay Buccaneers 10 at Dallas Cowboys 16". pro football reference. Retrieved December 18, 2012. ↑ "Cowboys run for 227 yards, most ever against Ravens, but still can't escape Baltimore with win". Dallas Morning News. October 15, 2012. Retrieved December 18, 2012. ↑ "Dallas Cowboys at Carolina Panthers - October 21st, 2012 | Pro-Football-Reference.com". Pro-Football-Reference.com. Retrieved 2016-05-09. ↑ "Cowboys outlast Browns for overtime victory". NFL. Retrieved December 17, 2012. ↑ Reedy, Joe (December 10, 2012). "Cowboys rally past Bengals with last-second field goal". Cincinnati Enquirer. Retrieved December 17, 2012. ↑ Spotrac.com. "Dan Bailey". Spotrac.com. Retrieved 2016-05-09. ↑ "Dallas at Washington | 2015-12-07 | National Football League | Yahoo! Sports". Yahoo Sports. Retrieved 2016-05-09. ↑ "Dan Bailey named NFC special teams player of the week". Retrieved 2016-05-09. ↑ "Dan Bailey, the NFL's all-time most accurate kicker, finally gets his due". star-telegram. Retrieved 2016-05-09. Wikimedia Commons has media related to Dan Bailey (American football).